The house is tastefully decorated with 2 bedrooms, a studio room as well en-suite bathrooms. The main bedroom has a king-size bed with an en-suite bathroom and access to the sun deck. The second room has a queen-size bed and bathroom. The third room is the studio upstairs with a queen-size bed and bathroom. Please note the studio has its own separate entrance. The kitchen is fully equipped with a scullery, tumble dryer, washing machine and dishwasher. The lounge is fitted with comfortable seating as well as a flat-screen TV with DStv. The dining room table seats 8 people. Thesen Island home has a Weber braai on the deck and is safe and secure with 24-hour security and access control. They are also within close proximity to Knysna town centre for all the local restaurants, shops and markets. This townhouse located in Plettenberg Bay sleeps 6. Sparrebosch \ Pezula is a premium golf course development on the Eastern Head at the Heads Knysna . 24 hour security with access control Gated community . 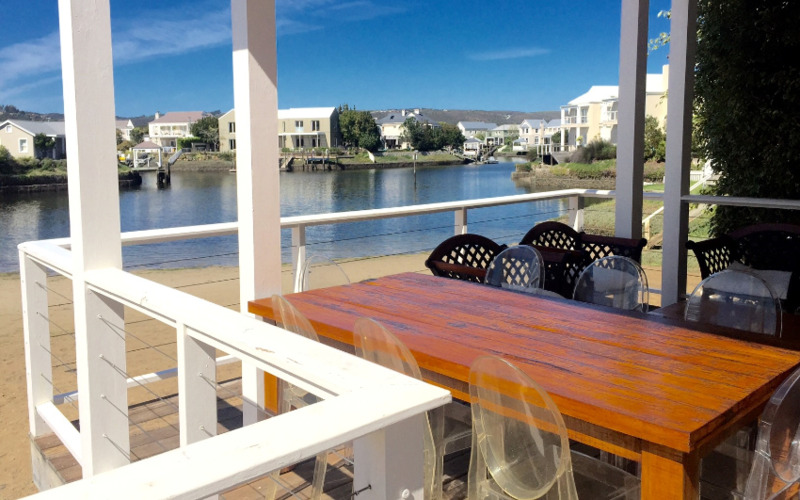 Situated on the Cove Beach and Waterway on Thesen Islands . Step off sun deck to beach . Gas and wood burning Weber on deck . Lounge has 55" flat screen T V dstv. Dining room seats 8 Kitchen scullery has dishwasher washing machine and T\Drier Master bedroom , king bed ,full en-suite Bathroom Second Bedroom has queen bed and en-suite bathroom . THE STUDIO doubles up as the 3rd bedroom and is actually a flat with a loft bedroom queen bed and bathroom . downstairs the studio has a kitchenette \ living area. the Studio has a sleeper couch in downstairs area ,too. This home can sleep 3 couples comfortably plus an extra adult or 2 young children on the sleeper couch.